Images of the comet 41P/Tuttle-Giacobini-Kresak obtained on March 19th, 2017 using the Discovery Channel Telescope. Most of the emission from the coma was artificially removed to show the structure of the jets. There is a difference of six hours between the two images and both jets are rotating clockwise. The faint jet on the left image increases in strength as sunlight hits the region, while the other jet nearly shuts off completely as its source on the nucleus moves into night. The comet rotation period was 24 hours and increased to 27 hours only ten days later. Credit: Schleicher/Lowell Observatory. Astronomers at Lowell Observatory observed comet 41P/Tuttle-Giacobini-Kresak last spring and noticed that the speed of its rotation was quickly slowing down. A research team led by David Schleicher studied the comet while it was closer to the Earth than it has ever been since its discovery. The comet rotational period became twice as long, going from 24 to more than 48 hours within six weeks, a far greater change than ever observed before in a comet. If it continues to slow down, it might stop completely and then begin rotating in the opposite direction. Comet 41P/Tuttle-Giacobini-Kresak is a short period comet that now completes an orbit around the Sun every 5.4 years. First discovered by H. Tuttle in 1858, it was lost for years until is was rediscovered by M. Giacobini in 1907. Lost again and rediscovered for a third time in 1951 by K. Kresak, now the comet holds the names of its three independent discoverers. Astronomers had a hard time studying this comet in detail until early 2017 when it passed within 13 million miles (21 million kilometers) from Earth, the closest since its discovery.With a relatively inactive nucleus estimated to be less than one mile in size (about 1.4 km), this comet was finally sufficiently bright for an extensive observing campaign. During eight weeks between March and May of this year, the comet remained at a distance of less than 18 million miles (30 million kilometers) from Earth. In comparison, the distance between the Sun and the Earth is 93 million miles. These conditions allowed astronomers to study it in great detail. Remnants from the formation of the Solar System, comets have changed very little during the past 4.5 billion years. As a comet gets closer to the Sun and the ice on its surface vaporizes, it develops gas and dust jets thousands of miles in length that ultimately create the coma or head, and the tail that distinguish comets from asteroids and other celestial bodies. One of the most common gases found in comets is the cyanogen radical, a molecule composed of one carbon atom and one nitrogen atom. Schleicher and his collaborators used Lowell Observatory's Discovery Channel Telescope, together with the Hall telescope and the Robotic telescope located on Anderson Mesa near Flagstaff, Arizona. 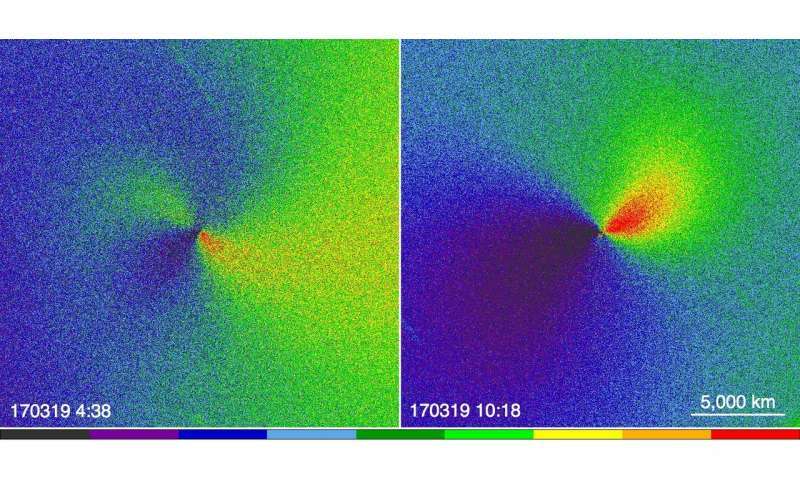 They found and measured the motion of two cyanogen jets coming from comet 41P/Tuttle-Giacobini-Kresak. From these jets, they determined that the rotation period changed from 24 hours in March to 48 hour in late April, slowing down to less than half the rotation speed by the end of the observing campaign in May. "While we expected to observe cyanogen jets and be able to determine the rotation period, we did not anticipate detecting a change in the rotation period in such a short time interval. It turned out to be the largest change in the rotational period ever measured, more than a factor of ten greater than found in any other comet," said Schleicher, who lead the project. This result also implies that the comet has a very elongated shape, a low density, and that the jets are located near the very end of its body, providing the torque needed to produce the observed change in rotation. "If future observations can accurately measure the dimensions of the nucleus, then the observed rotation period change would set limits on the comet's density and internal strength. Such detailed knowledge of a comet is usually only obtained by a dedicated spacecraft mission like the recently completed Rosetta mission to comet 67P/Churyumov-Gerasimenko," said collaborator Matthew Knight. Looking to the past on the other hand, brings another possible scenario. If the comet behaved similarly on previous orbits, it could have been rotating so fast that the nucleus might have broken, allowing more gas to escape and causing an increase in brightness for a short period of time. Such an outburst was observed in 2001. The preliminary results were presented during the 49th Meeting of the American Astronomical Society Division for Planetary Sciences held in Provo, Utah. The full team consists of David Schleicher from Lowell Observatory, Nora Eisner from the University of Sheffield, Matthew Knight from the University of Maryland, and Audrey Thirouin also from Lowell Observatory. Now if it also changes course, it; aliens! Very interesting. One has to wonder if the outflow will be sufficient to change its orbit.